A student-founded startup creating paper sensors to monitor breathing rates of hospital patients has won the White City Innovators' Programme. SpiraSense, founded by Imperial student George Winfield, is developing the low-cost sensors to speed up the diagnosis and treatment of sepsis in hospital patients. Sepsis is a life-threatening condition responsible for 44,000 deaths every year in the UK. It arises when the body overwhelmingly over-reacts in trying to control an infection, injuring its own healthy organs and tissue in the process, and is a particular risk for people already in hospital because of another serious illness. If it is caught early and treated quickly, most people make a full recovery. But without rapid treatment, sepsis can quickly lead to multiple organ failure and death in just a few hours. One of the early symptoms of sepsis is rapid breathing. Currently, breathing rate is measured manually by doctors on observation rounds. Tests show that SpiraSense can monitor respiratory rate continuously, as well as detecting other biomarkers for organ failure using only the patient's breath—something that would usually require an invasive and intermittent blood test. If adopted, an AI powered app could then alert doctors to possible patient deterioration in real time, allowing for faster diagnosis and treatment. George, who is undertaking an MRes in Medical Device Design & Entrepreneurship at Imperial, said: "The device learns from every breath a patient takes. It would allow doctors to see trends that might not be immediately apparent from manual observations, giving them more information to make an informed decision about patient care." Their small paper sensors, which are about the size of a postage stamp, are designed to attach to any breathing mask or nasal cannula already used in hospitals, potentially offering a low cost solution. 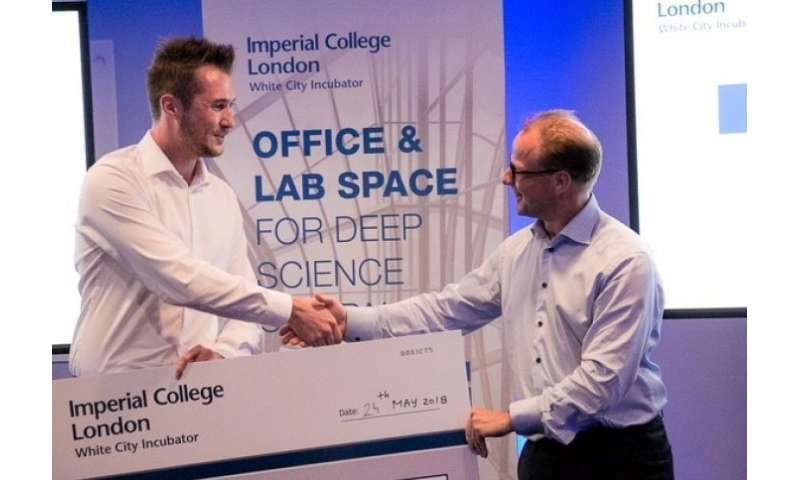 SpiraSense was awarded a £7,000 prize package, including a 12-month membership at the Imperial Incubator and £5,000 to support the business's growth. George is currently engaged with securing further funding to develop his device ready for clinical testing. Delivered in partnership with NatWest, the Innovators' Programme is the Imperial Incubator's flagship pre-accelerator programme. It aims to support the development of technology focussed early-stage companies by providing funding, mentoring, access to Imperial's innovation ecosystem, free space to work, and training in areas such as fundraising, team building, IP, marketing and pitch practice. The programme runs twice a year at the White City Incubator, and is aimed at Imperial alumni, current students, and tech businesses from the local area. George added: "It has been fantastic to work with such a diverse range of people and businesses on this programme. You really learn a lot from other perspectives and approaches. "The mentoring on the programme has been especially valuable. It's great to be able to bounce ideas around with people who have such great experience and networks." Imperial, Chris Tilley – Director of the Investor Club at Coutts Private Banking, and Peter Ryan-Bell—Head of Large Corporate & Sectors UK & Western Europe at RBS. Rightly, founded by Alexander Arbuthnot and Tom Andrews, took home second prize for their start-up that allows consumers control over how their data is used by companies by automating subject rights requests enabled under DGPR. Fourth prize went to ifPlus, founded by Imperial College Business School alumnus Tassilo Vogel, a decision-making tool and knowledge sharing platform that would allow users to search for advice for a variety of different situations. E. coli—are we measuring the wrong thing?